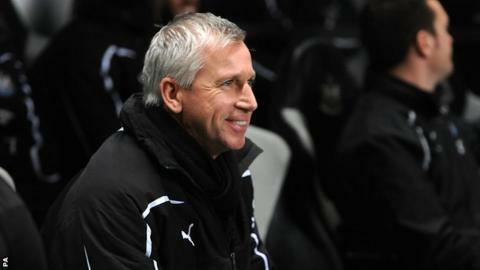 Manager Alan Pardew praised his Newcastle United players for giving him "a perfect night" after they beat Bordeaux 3-0 in the Europa League. Strikes from Shola Ameobi and Papiss Cisse, plus an own goal from Henrique, put the club top of Group D.
"That was a team that hasn't been beaten for 17 games," the 51-year-old said. "So, that is a great result." "It was a perfect night. We knocked the spirit out of them in terms of the clinical nature of our goals." French side Bordeaux went into the game having last been defeated in April, but had no answer to Newcastle's vibrant attack. Pardew continued: "What we have to be careful of is that we have got a return match in Bordeaux and they showed in that first 30 minutes that they are a very good side. "The second leg will worry me, I have to say, because what I saw was a very good side. "It just all fell for us. The goals were at good times and it worked for us." Winger Gabriel Obertan excelled against his former club as he put in one of his best performances for Newcastle, with his superb run and cross for Ameobi's opening goal the highlight. Obertan has regularly failed to impress in the north east, since joining from Manchester United last summer, but Pardew hoped the 23-year-old would learn from Thursday's game. "People's expectations of him are too high because they want to see him race past the full-back every time, and it's impossible," Pardew said. "If he did, the full-back would know what he was going to do, so he has to mix his game up. "He has to get the balance right - I thought he did. He was excellent."